Scottsdale, AZ (September 26, 2011) – The small but almighty cupcakes unite once again on Sunday, October 30, 2011, for the second annual Cupcake Love-In at the Hotel Valley Ho as local bakers and restaurants join together to support Central Arizona Shelter Services (CASS). The “Love-In” is growing. After 2010’s successfully sold out inaugural event, this year is slated to feature upwards of 40 or more participating bakers, a few hundred more attendees and the addition of a special VIP hour before the main event. Most importantly, this year’s larger numbers translate to more dollars for CASS with 100% of all ticket sales along with all raffle ticket sales donated directly to the charity. For over 25 years as the largest provider of shelter and supportive services for homeless individuals in Arizona, CASS provides shelter to more than 1,000 people each night including many veterans and families. This year’s Cupcake Love-In is bringing back the popular Kids Corner decorating station, the infamous cupcake eating contest for the young-at-heart grown ups, a host of raffle prizes, photo booth and the cupcake competition judged by a panel of celebrity bloggers and beloved local foodies. Giving the day that extra cherry on top are returning emcees, ABC 15’s Andi Barness and Thomas Smith (aka: The Culinary Comedian). A few new components to this year’s Love-In are the special VIP hour taking place just before the main event and a Kids Costume Contest in celebration of Halloween weekend. The event will take place from 11am – 2pm on Sunday, October 30 with the VIP hour from 10am – 11am. Tickets to the Cupcake Love-In are $20 for adults, $50 for VIP entry and $5 for children ages 10 and under. Tickets are available online only at Cupcakelovein.stayclassy.org. For more information about the event, visit CupcakeLoveIn.com and to learn more about Central Arizona Shelter Services please visit cassaz.org. Fleming’s Raises Two Glasses For Breast Cancer Awareness Month. Fleming’s Prime Steakhouse & Wine Bar raises not just one but two glasses honoring Breast Cancer Awareness Month with on its new “5 for $6 ‘til 7” bar menu. Fleming’s new signature cocktail The Stiletto and Cline Cellar’s Cashmere wine will raise funds for organizations providing research and support in the fight of the disease. The Stiletto martini is Fleming’s newest Skinny Cocktail. Fleming’s Director of Wine Maeve Pesquera created the 99-calorie drink in celebration of the women whose lives have been affected by breast cancer. The Stiletto is Fleming’s first gin-based skinny cocktail. It muddles Hendrick’s Gin with fresh blackberries, Monin, and lime juice and is topped with a float of diet ginger ale. During October, 100% of the sales of The Stiletto will be donated back to the Avon Breast Cancer Crusade. The Avon Breast Cancer Crusade was launched in 1992 as a small pioneering program in the U.K. Avon in the U.S. adopted the Crusade the following year. Over the last 17 years, Avon philanthropy has raised and donated more than $640 million to breast cancer programs around the world, supporting cutting-edge research to find a cure for or prevent breast cancer as well as programs that enable all patients to access quality care. Also in October, Cline Cashmere wine will be featured by the glass on the “5 for $6 ‘til 7” menu. 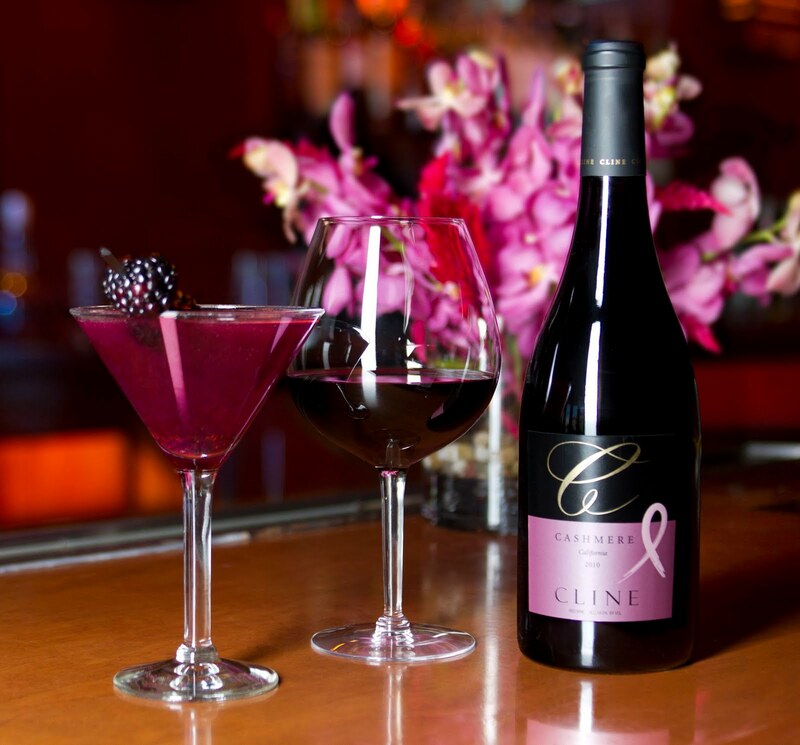 Cline Cellars is making a $25,000 donation to Living Beyond Breast Cancer through the sales of Cashmere during the month. Guests ordering Cline Cashmere will receive a complimentary pink ribbon wine charm (available after October 5). Fleming’s has four restaurants in Phoenix located in Scottsdale, DC Ranch, Chandler and Peoria. Posted on September 29, 2011 Categories Cline Cellars, Fleming's Steakhouse, Food and Wine, Scottsdale.breast Cancer awareness MonthLeave a comment on Fleming’s Raises Two Glasses For Breast Cancer Awareness Month. WHAT: Celebrity Chef Stephanie Izard is coming to Scottsdale to host an event with Chef Beau MacMillan (elements) and Chef Randy Zweiban (Province, Chicago & Phoenix). Guests will have the opportunity to enjoy a multi-course dinner featuring recipes from Izard’s newly launched cookbook – Girl in the Kitchen (available October 5, 2011, Chronicle). Izard will also draw inspiration for the evening’s dishes from Arizona’s local and seasonal produce making this a truly tailored and unique experience for guests. WHY: This stop in Scottsdale is part of the nationwide “Goat Tour,” which will bring Chef Stephanie Izard into cities across the country to celebrate the release of her new cookbook Girl in the Kitchen as well as raise money for Share Our Strength. As Izard makes her way across the U.S., she will team up with fellow James Beard nominees, Food & Wine Best New Chefs and celebrity chef friends to bring the events to life. For more information on Izard’s “Goat Tour”, visit goat-tour.com. Share Our Strength is a national non-profit aimed at ending childhood hunger in America by 2015. Izard has been involved with Share Our Strength for many years, participating in their chef focused Chicago event, Taste of the Nation. For more information on Share Our Strength, visit strength.org. WHO: Selected as one of the Best New Chefs in 2011 by Food & Wine, Stephanie Izard is the chef/partner of the Chicago restaurant Girl & the Goat. A 2011 James Beard ‘Best New Restaurant’ nominee, Girl & the Goat has been praised by high-profile publications such as Saveur, New York Times, Food & Wine, Better Homes and Gardens and others. Izard is the first and only woman to win Bravo’s Top Chef (Season 4/2008) and is the only winner of the original version of the show to take the title of “Fan Favorite.” She is also a graduate of the Scottsdale Culinary Institute. In addition to the local culinary talents of Chefs MacMillan and Zweiban, are national cocktail designer Kim Haasarud, a.k.a. the Liquid Chef, who will be joined by local cocktail maestro Travis Nass of Rancho Pinot, and wine and spirits aficionado, Dave Johnson. Diners will also get a chance to experience Mulch Coffee, the java bar for The Accidental Yard and coffee kings Brian Clemens and Jason Calhoon. TICKETS: Tickets will be available online at gout-tour.com starting September 27 at 10am. Tickets are $150 per person and include dinner, open bar and wine tastings, meet and greet with the chefs and a signed copy of “Girl in the Kitchen”. INTERVIEWS: Stephanie Izard is available for photo opportunities and can discuss her new cookbook “Girl in the Kitchen” and her dedication to Share Our Strength in an in-studio interview. 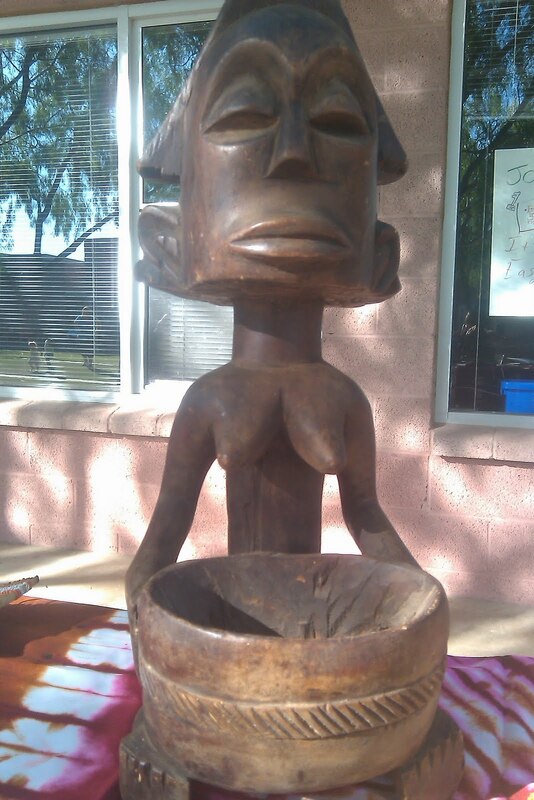 Welcome to America Project’s “The Congo in Context” Dinner. The Welcome to America project started in the days after the tragedy Sept. 11, 2001 and helps political refugees by delivering furniture and other household goods to homes they have relocated to in the Phoenix area. WTAP often does dinners with refugees in an effort to raise awareness and culture of there homeland(s) and use it as a fund raiser for expenses incurred running WTAP. The most recent dinner was with refugees, culture and food from Congo or Democratic Republic of Congo (DRC). Congo was 1st settled by Belgian settlers and gained independence in 1960. It is the 2nd largest country in Africa and is rich in minerals such as gold and diamonds. Several languages are spoken in Congo with French and Swahili are the most spoken. We dined on foods that are similar to those found here. Goat meat is eaten quite a bit in Congo and was served with vegetable and Basmati rice seasoned and mixed with raisins, along with chicken and vegetable stew. 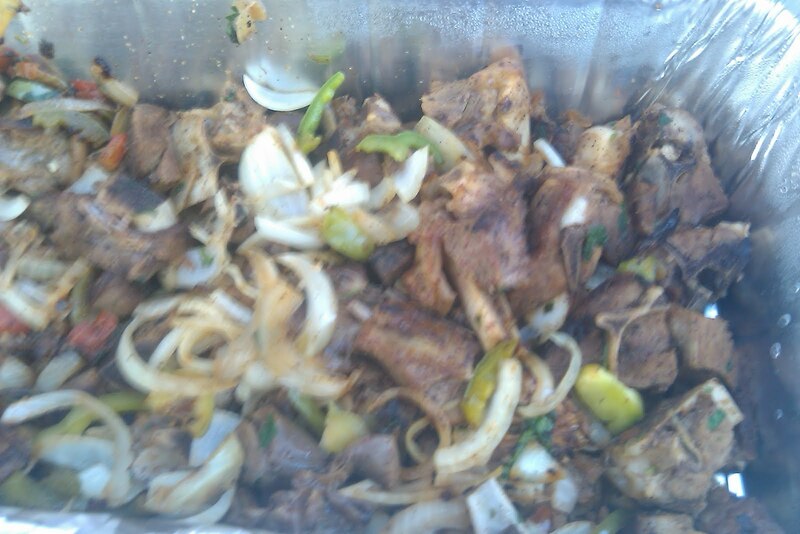 The goat meat was nice treat as I was not sure what to expect. Dr. Joseph Kimbuende who left Congo over 20 years ago and now teaches at Phoenix College spoke about the current situation in Congo and about it’s rich history and culture. Recent refugee Dieudonne Mubalama spoke also. Music and dance was performed by Penuel Ministry Choir. Posted on September 27, 2011 Categories Congo, culture, goat meat, political, refugee WTAP, Welcome to America ProjectLeave a comment on Welcome to America Project’s “The Congo in Context” Dinner. Timing is everything in life and I timed my annual visit back east very well going after earthquakes, a hurricane and the 10th anniversary of Sept. 11th. Not to mention the evening of my arrival brought cooler temps to the area which caught some people off guard, but I was loving the 50 & 60 degree nights and days. As always there’s some regular visits to favorite eateries and plenty of time to find more. Here is what I saw, tasted and heard on my visit….. Lunch on day of arrival was with a college friend in NJ at the Cornerstone in Hillsdale. A neighborhood bar and grill in center of town across for RR station. Good bar food and atmosphere. Returned on Sun. with the guys for beers and football. Big and lots of old wood decor. Dinner in the city was down in the Bowery at Great Jones Cafe, where they make delicious Cajun dishes. Jambalaya and wings were spicy and good. Small spot w/ cool, grungy atmosphere. On the way to meet up with friend at his Gramercy Park apartment I bar hopped, stopping and having sangria at Green Square Tavern on 21st St. then a pricey pint at the Jade Bar at the Gramercy Park Hotel. Stopped in to Astor Wine & Spirits after dinner to help my friend pick up a few bottles for the weekend. Good selection and attentive staff, plus a John Legend sighting made for a good 1st time visit. After catching up on some sleep, I made an early lunch visit to White Manna Hamburgers on the other side of the Hackensack river. A local institution that is home to some of the best sliders in the northern hemisphere. 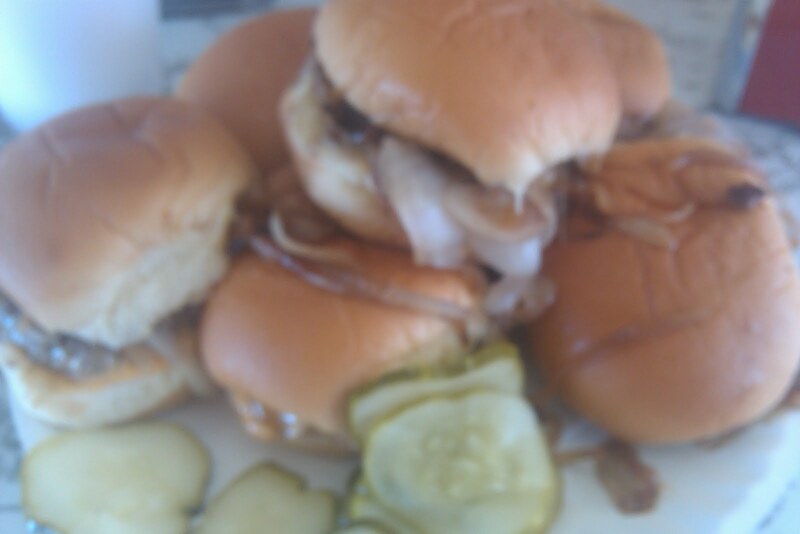 Cooked on a flat top right in front of you the sliders are juicy, yummy and made to order. Always a must when in northern NJ. Catching a ride with a friend who dropped me at the Waldorf Astoria Hotel, where another friend was staying, I embarked on my journey downtown and across to the Down Under the Manhattan Bridge Overpass(DUMBO) neighborhood of Brooklyn. Walking through Grand Central Terminal and seeing the architecture and the hustle and bustle of people coming and going is always good. Southbound on 3rd. Ave. I retrace some of my steps from the night before in a daylight perspective. Around Gramercy Park and into Union Square Park I find myself during there Fri. afternoon farmers market. It is here I get my 1st taste of NY State Pinot Noir from Tickle Hill Vineyards. A good, 5 year old that tasted like Pinot Noir. After stopping to recharge with a coffee in the village I found myself waiting to cross Houston St. realizing that the 1 and only Katz Deli was a few blocks away. A family favorite for 4 generations, it’s been a long while since I last made a visit. Nothing seems to change here as you are still presented a ticket on your way in that gets punched to be totaled by cashier on your way out. Deli sandwiches and other deli delicacies are available. Not wanting to ruin my dinner, I went simply with a hot dog covered with sauerkraut and a potato knish. Just the way I had remembered it, but no moaning from this guy. 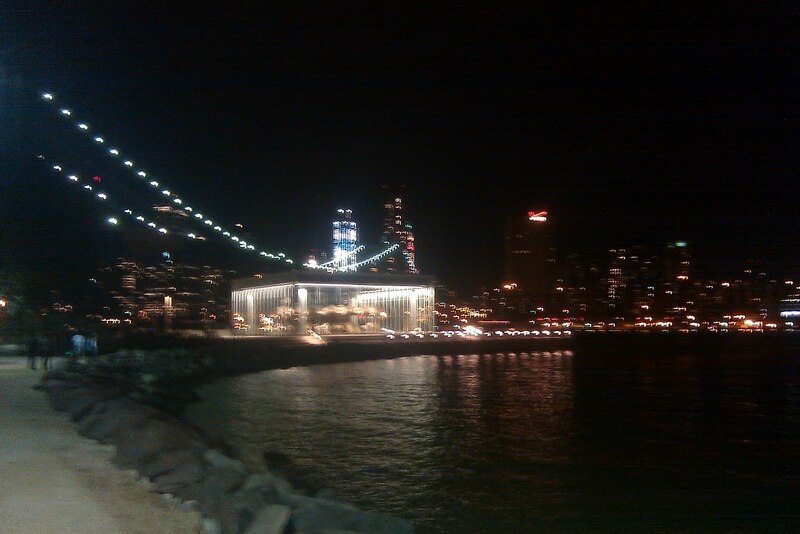 I made my way around the Brooklyn Bridge Park with views up and down the East River, New York Harbor and Manhattan. Great views usually reserved for movie and TV back drops. 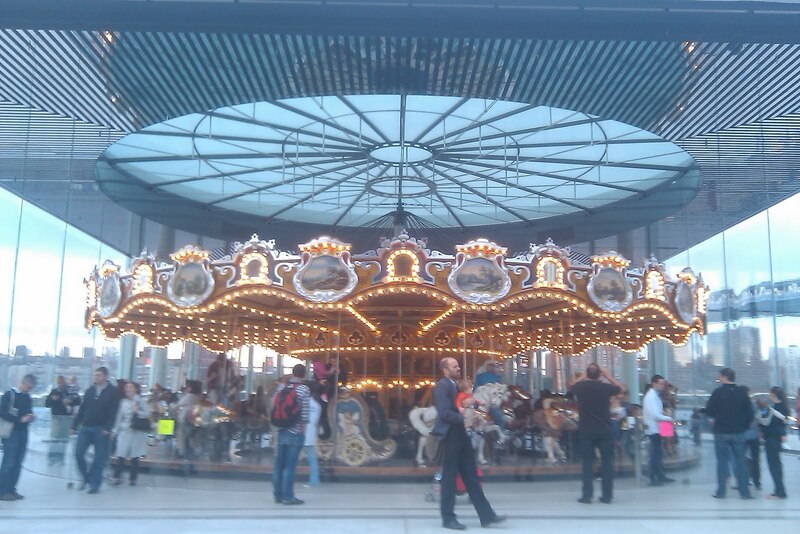 Also came across Jane’s Carousel, that had been dedicated the night before and opened to the public that day. In a glass enclosed structure only feet from the river is a carousel, built in the early 1900s, that has been in restoration and storage since 1984 by Jane and her artists. With the dinner hour finally arriving I make my way to Bubby’s, just off the park. Meeting up with out of town family and guests we dine on a cross between BBQ and Jewish deli food that I heard a lot of good things about. My house cured bacon wrapped meatloaf was good and so were the sides off mac n cheese and cole slaw. Our server was a bit overwhelmed w/ the off the menu ordering of about 25-30 people and it was a while before she got some help, a bit of a downer for some. Too tired to make that trek back uptown I made my only visit to the subway, to the bus terminal for a bus back to NJ. Feeling just as tired now reliving last week as I was at the end of my day I will continue with my weekend adventures on the next post. 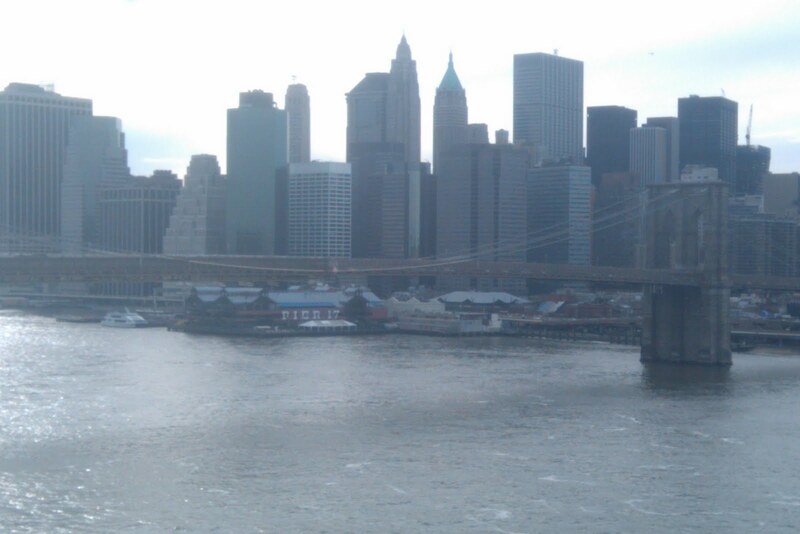 Let me know what you can relate too and your adventures in NYC. Private Rack GastroPub to open at end of September in Scottsdale. Chef Leonard Jay’s dream of opening a British style Gastropub is coming to life in real life and on reality television. In an old house, office and sandwich shop Chef Jay’s team has transformed it into a large full service pub that will serve 3 meals a day and stay open very late after everybody else closes. Chef Jay is a 2 time winner of Food Network Challenges and has built his reputation with several restaurants and concepts in the Phoenix and Denver area. After searching valley wide for several years, Chef knew this old town Scottsdale location was perfect when he saw it and told the realtor to “take your sign down, let’s work out a deal”. British pub favorites of Bangers and Mash along with pizza from a dining room oven, will be available along with many other yet unpublished menu items. A billiard room, a hanging herb garden patio and other rooms will be available for small to medium size private parties and a large patio will be ready just in time for our bragging weather. In an effort to keep cost down and leave a smaller foot print, Chef Jay is using some scrap wood for wall panels and scraps of the scraps for other design purposes. Part of Chefs plan is to be sustainable and not let anything go unused when possible. Much of the furniture consisting of sofa, armchairs and coffee tables will be available on the restaurants website. Mixologist Travis Nass is running the beverage program and will be building a value oriented, worldly wine list along with a drinks list he’s built in the years he’s been in the Scottsdale area restaurant and bar industry. Posted on September 14, 2011 Categories Chef Leornard Jay, Food Network, Private Rack Gastropub, Scottsdale, Travis Nass, wineLeave a comment on Private Rack GastroPub to open at end of September in Scottsdale. In a post of a few days ago I blogged about Andrew Murray Vineyards and 2 of his Syrahs that I tasted. In this post I will blog about 3 blends I and some wine enthusiasts tasted from Andrew. 2010 RGB Camp 4 Vineyard- The only white wine we tasted, this 50/50 blend of Rousanne and Grenache Blanc comes from Santa Ynez Valley. Fermented together in stainless steel and then put into neutral French oak until its time to bottle. It has melon and pear aromas on the nose & sweet vanilla and honeysuckle on the palate. It’s dry wine and has good acidity, a medium body and medium finish. Only 200 cases were made of this white Chateauneuf du Pape like wine and retails for about $25. 2008 Esperance(“Hope” in French) from the Central Coast is a blend of 60% Greanche Noir from Paso Robles, 25% Syrah from Santa Ynez Valley and 15% Mourvedre from Paso Robles. Big on the nose and the palate, this wine uses a lot of new French oak and grapes from both warm and cool climates. Buttery and with nice tannins, it’s well balanced and has a nice, long finish. It tastes great and has the best finish of the 5 wines tasted. 400 cases were produced and is a steal at $30. 2009 Syrah Watch Hill Vineyard from Santa Ynez Valley is blended with 5% Viognier. Aged for 18 months in French oak barrels, half which were new this is a full bodied wine with a smoky, bacon nose. With good raspberry fruit this wine has a shorter finish. Several tasters said “WOW” upon their 1st taste. Only 212 cases made and should retail for about $36. So after tasting 5 wines from Andrew Murray Vineyards my fellow wine drinkers agree that the accolades from Robert Parker and others are worthy. If you find Andrews wines on your wine stores shelf or a restaurant wine list, do yourself a favor a give these limited production wines a try and see why they drink like you should be spending a lot more money than you actually will. Cheers! A few more grapes that you may not of heard of ….yet! GRENACHE BLANC is a white grape found in Rhone region of France, also southern France and a northeast Spain. A little bit can be found in growing in the central coast of California. Related to the red grape, Grenache, Grenache Blanc when made into wine is high in alcohol and low in acidity. It’s often blended with another Rhone grape ROUSANNE and other white Rhone blends. PINOT MEUNIER is a black wine grape and is most often used in the making of Champagne. Experts think it’s a mutation of Pinot Noir. It is also found grown in Germany where it is used in red wines and also found in the Carneros region of California, Oregeon and down under in Australia and most recently New Zealand. ST> LAURENT is red grape found in Austria and Germany and is part of the Pinot Noir family. It is known for having a big aroma. It’s also widely planted in the Czech Republic. When crossed with the grape BLAUFRANKISCH you get the grape ZWEIGELT that can be found growing in Austria. Stay tuned for more in upcoming posts. Posted on September 7, 2011 Categories Australia, Austria, France, grapes, Grenache, Oregon, Rhone, Spain, wineLeave a comment on What grape is that….? I recently sat down with a group of wine enthusiasts to taste 5 of Andrews recent releases. In this post I will give our thoughts on the 2 Syrahs and in another post I will share what we thought on the 3 of the blends tasted. 2008 Tous les Jours Syrah- The name translates to “everyday” and could be drank that way. Aged for 11 months in new and used French oak barriques after the grapes were fermented in both open and closed top tanks. Sourcing grapes from vineyards in Paso Robles and Santa Ynez, this Central Coast bottling had aromas of red bell peppers and tobacco on the nose and was soft on the palate and had a long finish. Drinkable now it should get better with a couple years of aging. This wines was considered very good by the panel. 2,500 cases were produced of this wine and should retail for about $20. 2008 Terra Bella Vineyard Syrah- Making a mere 240 cases,this Paso Robles bottling comes from a hillside vineyard near Halter Ranch and Tablas Creek. A nice nose, this wine is big on fruit, thick and is a deep colored wine. With raspberries and blueberry nuances, this wine was aged at least 18 months in mostly new French oak barrels. Nice and balanced the group felt this was the best of the 5 wines tasted and a great deal at $36. As I often blog about wine I occasionally I blog about films I get to preview before their release(See earlier posts). As most of you know me as a wine guy, I’m also a aspiring film producer and anytime I get to hear from other film industry professionals I jump at the opportunity. This was the case when I got an invite to see the only Phoenix area preview of “The Way” that will be released on Oct. 7th. In addition to the preview actor Martin Sheen & the films writer/producer/director and actor Emilio Estevez were on hand to do Q & A session after the film. As this is a passion project for both of them, Phoenix was one of the 1st stops on a 50 day cross country pilgrimage on a bus to promote the film as, most passion projects are not on the radar of Hollywood movie executives in this day and age,sadly to say. So word of mouth and self promotion is a must if you want to get the film out to a wider audience. The story starts in Ventura California where Tom (Martin Sheen)is a widowed opthamologist, who must take an unexpected trip to a town at the base of the Pyrenees mountains on the French-Spanish border. This is the starting point for the Camino de Santiago or “The Way of St. James” where pilgrims make a modern day journey through the Basque countryside on the way to the northwestern Spanish city of Santiago de Compostella. Tom decides to make the pilgrimage his son Daniel (Emilio Estevez) started but could not complete. Along the way Tom sets out alone and is very reserved. As there are many people making the pilgrimage for many reasons religious, personal or professional Tom has several run ins with others on the path, whether it’s a yarmulke wearing priest wearing or the joint smoking Dutchman, Yoost (Yorick Van Wageningen) who is doing it to lose weight. Tom slowly opens up and builds a bond with Yoost, Sarah(Deborah Kara Unger), a Canadian looking to quit smoking and Jack(James Nesbitt) a writer from Dublin who’s writing a book about The Camino. As they walk through vineyards, towns in the Basque countryside they realize they have more in common than their age and back rounds would suggest. When they stop for the night or just for a rest the Basque culture comes through as there is always a bottle of wine or two or three present with meals which leads to some interesting encounters with the locals. As they get closer to their destination they also get closer as a group having Tom’s back when he needs it. Although a drama with deeper meaning, there several lighter moments with laughter, which one often finds on our own journey through life. During the Q & A after, we find not only was this a family affair with Martin and Emilio but Emilio’s son worked on it and married a woman he met on set and now lives in the town of Burgos, where some of the film was filmed. Martins daughter plays his office assistant in the opening scene. Martin spoke of our sense of community, especially during these trying times and how a family reunion in Ireland in 2003 inspired the The Camino and asked Emilio to write a script. Emilio also spoke of his inspiration for the soundtrack which includes James Taylor and Alanis Morissette. Despite it’s small budget and crew some big performance’s come out and and hopefully the acting and writing will get the recognition they deserve. Not to mention the Basque countryside makes me want to put The Camino on my bucket list.